The wonderful thing about plátanos (plantains) is that they truly are a versatile food. As a plátano ripens, its high starch content changes to sugar. Plátanos are good at any stage; it just depends on what you want to make. Plátanos are a relative of the banana, but are bigger, less sweet and need to be cooked before they are eaten. Plátanos also keep their shape when cooked, unlike bananas, which get mushy. Green or "unripe" plátanos are starchy vegetables. They can be used in soups, stews, boiled and mashed. 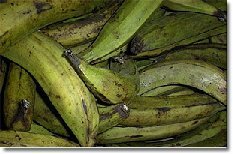 Most Puerto Rican recipes that use plátanos call for green plátanos and need to be VERY green without a hint of yellow. The next stage of ripeness is when the skin is mostly yellow with a few black speckles. In this stage of ripeness, the plátanos has lost some of its starch and is slightly sweet. Plátanos "amarillos" are usually fried but can be boiled and baked as well. To fry them just peel, slice, and fry. In Puerto Rico both green and amarillos are served with meals as a side dish. If you need ripe plátanoss and only have green ones, they ripen at room temperature, out of direct sunlight, in a few days. When peeling plátanos, moisten hands and rub with salt to prevent the juices from sticking to your hands. Cut off about 1 inch from both ends as in figures 1 & 2. Now drop them in very hot water for easier peeling. Just let them sit in the water for a few minutes or so. While holding the plátano steady with your left hand, use your right hand to slide the tip of the knife under the skin and begin to pull it away, going from top to bottom. (fig 4). Soak the peeled plátanos in salted water. Drain on a paper towel to use in your recipe. In Puerto Rico we also eat green unrippened bananas - the same bananas we get at the grocery store, but still green. We boil them or fry them, and use them in many recipes. 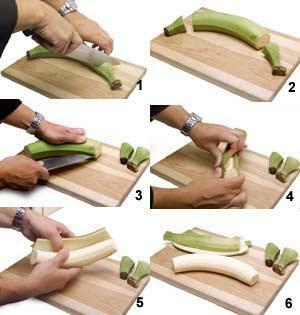 The peeling process for green bananas is the same as shown here. Did you know that there are over 500 different types of bananas. That means if you ate a different kind of banana everyday, it would take almost a year and a half to eat every one. Although generally regarded as a tree, this large tropical plant is really an herb. That means it does not have a woody trunk like a tree. The compacted, water-filled leaf stalk is composed of leaf sheaths that overlap each other and grow from an underground stem called a rhizome.. The banana plant can grow as high as 20 feet (or 6 meters) tall. That's as big as a 2 story house. They are the world's largest herb. Bananas are not just green and yellow, some bananas are red. Bananas are almost fat free. One banana is about 99.5% fat free! An average banana contains about 90 calories. Bananas are great source of potassium. Potassium helps build muscle power and keeps your body fluids in balance. Plátanos are a type of banana that is treated like a vegatable. It is not eaten raw and needs to be cooked. 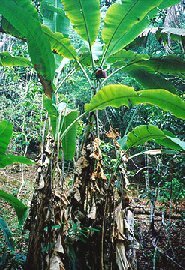 Plátanos and banana trees can be purchased in plant nurseries. Keep indoors as houseplants. They like moisture and heat. Mist the leaves often. As the green color of bananas turns to yellow, the starch in the fruit turns to sugar. .
quitan de encima de mi. 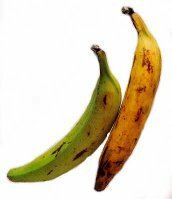 To boil plátanos and guineítos verdes . . . .
Cut off the ends and make a lengthwise slit on the banana skin. Use enough salted water to cover plátanoss over two inches. plátanoss should boil for 15 to 20 minutes. Feel with a fork to see if they are ready. You don't want them mushy but slightly hard at the center. These may be used in cooking or served with olive oil as a side dish.